Not to be confused with King's College London. King's was founded in 1441 by Henry VI, soon after he had founded its sister college in Eton. However, the King's plans for the college were disrupted by the Wars of the Roses and resultant scarcity of funds, and his eventual deposition. Little progress was made on the project until in 1508 Henry VII began to take an interest in the college, most likely as a political move to legitimise his new position. The building of the college's chapel, begun in 1446, was finally finished in 1544 during the reign of Henry VIII. King's College Chapel, Cambridge is regarded as one of the greatest examples of late Gothic English architecture. It has the world's largest fan vault, and the chapel's stained-glass windows and wooden chancel screen are considered some of the finest from their era. The building is seen as emblematic of Cambridge. The chapel's choir, composed of male students at King's and choristers from the nearby King's College School, is one of the most accomplished and renowned in the world. Every year on Christmas Eve the Festival of Nine Lessons and Carols (a service devised specifically for King's by college dean Eric Milner-White) is broadcast from the chapel to millions of listeners worldwide. On 12 February 1441 King Henry VI issued letters patent founding a college at Cambridge for a rector and twelve poor scholars. This college was to be named after Saint Nicholas, upon whose saint day Henry had been born. The first stone of the college's Old Court was laid by the King on Passion Sunday, 2 April 1441, on a site which lies directly north of the modern college and which was formerly a garden belonging to Trinity Hall. William Millington, a fellow of Clare College (then called Clare Hall) was installed as the rector. Henry directed the publication of the college's first governing statutes in 1443. His original modest plan for the college was abandoned, and provision was instead made for a community of seventy fellows and scholars headed by a provost. Henry had belatedly learned of William of Wykeham's 1379 twin foundation of New College, Oxford and Winchester College, and wanted his own achievements to surpass those of Wykeham. The King had in fact founded Eton College on 11 October 1440, but up until 1443 King's and Eton had been unconnected. However, that year the relationship between the two was remodelled upon Wykeham's successful institutions and the original sizes of the colleges scaled up to surpass Wykeham's. A second royal charter which re-founded the now much larger King's College was issued on 12 July 1443. On 1 September 1444, the Provosts of King's and Eton, and the Wardens of Winchester and New College formally signed the Amicabilis Concordia ("friendly agreement") in which they bound their colleges to support one another legally and financially. Members of King's were to be recruited entirely from Eton. Each year, the provost and two fellows travelled to Eton to impartially elect the worthiest boys to fill any vacancies at the college, always maintaining the total number of scholars and fellows at exactly seventy. Membership of King's was a vocation for life. Scholars were eligible for election to the fellowship after three years of probation, irrespective of whether they had achieved a degree or not. In fact, undergraduates at King's – unlike those from other colleges – did not even have to pass university examinations to achieve their BA degree and instead had only to satisfy the college. Every fellow was to study theology, save for two who were to study astronomy, two civil law, four canon law, and two medicine; all fellows save those studying secular subjects were obliged to take Holy Orders and become priests, on pain of expulsion. In 1445 a Papal Bull from Eugenius IV exempted college members from parish duties, and in 1457 an agreement between the provost and chancellor of the university limited the chancellor's authority and gave the college full jurisdiction over internal matters. The original plans for Old Court were too small to comfortably accommodate the larger college community of the second foundation, and so in 1443 Henry began to purchase the land upon which the modern college now sits. The gateway and south range of Old Court had already been built, but the rest was completed in a temporary fashion to serve until the new court was ready. However, the new college site would itself be left unfinished and the "temporary" Old Court buildings, arranged to accommodate seventy, served as the permanent residential fabric of the college until the beginning of the 19th century. Henry's grand design for the new college buildings survives in the 1448 Founder's Will which describes his vision in detail. The new college site was to be centred on a great courtyard, bordered on all sides by adjoining buildings: a chapel to the north; accommodation and the entrance gate to the east; further accommodation and the provost's lodge to the south; and a library, hall and buttery to the west. Behind the hall and buttery was to be another courtyard, and behind the library a cloistered cemetery including a magnificent bell tower. The first stone of the chapel was laid by the King on St James' Day, 25 July 1446. However, within a decade Henry's engagement in the Wars of the Roses meant that funds began to dry up. By the time of Henry's deposition in 1461, the chapel walls had been raised 60 ft high at the east end but only 8 ft at the west; a building line which can still be seen today as the boundary between the lighter stone below and the darker above. Work proceeded sporadically until a generation later in 1508 when the Founder's nephew Henry VII was prevailed upon to finish the shell of the building. The interior had to wait a further generation until completion by 1544 with the aid of Henry VIII. The chapel would be the only part of Henry VI's Founder's Will to be realised. It has been speculated that the choice of the college as a beneficiary by the two later Henrys was a political one, with Henry VII in particular concerned to legitimate a new, post-civil war Tudor regime by demonstrating patronage of what was by definition the King's College. Later building work on the chapel is marked by an uninhibited branding with the Tudor rose and other symbols of the new establishment, quite against the precise instructions of the Founder's Will. The college remained as the Old Court, chapel and a few small surrounding buildings for nearly two-hundred years until in 1724 the architect James Gibbs provided a new plan to complete the courtyard of which the chapel formed the north side. Although his design was for the courtyard to be closed by three similar detached Neoclassical buildings, due to lack of funds only the western of these was constructed. The first stone of what became known as the Gibbs' Building was laid by Provost Andrew Snape, at the time also vice-chancellor of the university, on 25 March 1723 and the building completed six years later. Front Court was finally completed in 1828 under plans drawn up by William Wilkins. The courtyard was closed by a screen and gatehouse to the east; and residential staircases either side of a hall to the south. The southern buildings continued towards the river with a library and Provost's lodge. All these buildings were, at the college's insistence, built in the Gothic Revival style rather than Wilkins' preferred Neoclassical. With the courtyard to the south of the chapel now able to accommodate the college, the land to the north was sold to the university in 1828. The university demolished most of the original Old Court buildings in order to make room for an extension to the University Library; only the gateway arch opposite Clare College survives. The library subsequently moved away from this site, known as the Old Schools, and the buildings are currently used for the main administrative offices of the university. Under the provostship of Richard Okes, from 1850 until his death in 1888, the college began a period of reform. On 1 May 1851 it was agreed to abolish the privilege of King's members to be granted a degree without passing the university examinations. In 1861 the college statutes were amended so as to expand the college and, more radically, to allow for the election of non-Etonian King's members: the new statutes provided for forty-six Fellows, twenty-four scholarships reserved for boys from Eton, and twenty-four "open" scholarships for boys from any school. At the same time all formal obligation to take Holy Orders – unenforced since the seventeenth century – was removed. The statutes were again amended in 1882, this time ensuring fellowships were not always for life and were awarded on merit after submissions of original research. In his 1930 memoir As We Were, A Victorian Peep Show, King's alumnus E. F. Benson recollected the peculiar behaviors of some of the surviving Life Fellows from his undergraduate years of 1887 – 1890 and before. Of one he wrote, “He then shuffled out on to the big lawn, with a stick in his hand, and he prodded with it at the worms in the grass, muttering to himself, ‘Ah, damn ye: ye haven’t got me yet.’ The first non-Etonian students were admitted to study at King's in 1865, and the first non-Etonian scholars and the first non-Etonian fellow were elected in 1873. These reforms continued over subsequent decades and there are now no special privileges for Etonians at King's. The expansion of the college through the 1861 statutes necessitated more building work to accommodate the larger community. In 1869, the area along King's Parade between the Wilkins' Buildings and King's Lane was built upon after a design by George Gilbert Scott. When completed a year later, the new courtyard formed was named after Walter Chetwynd, a fellow of the college. However, after subsequent plans to expand college accommodation fell through King's opened negotiations to amalgamate with St Catharine's College. Although St. Catharine's had been founded by Robert Woodlark (sometimes spelled Wodelarke), a Provost of King's, the college declined the invitation to combine. Eventually, in 1893, the east and south wings of another new courtyard within King's – designed by George Frederick Bodley and overlooking the river – were completed. In 1909, the south range of third new courtyard – named for its architect Aston Webb – was built to the south of the library. In 1927, designs by G. L. Kennedy completed Bodley's Court with a new northern range, and Webb's Court with a new Provost's Lodge on its western side. In 1930, a Cambridge Borough Police officer was shot by a student who also shot his tutor in the same incident. On 1 September 1939, the day of the German invasion of Poland and the cause of the UK's entrance into World War II, permission was sought from the College Council to remove the stained glass from the east window of the chapel. By the end of 1941, all the ancient glass had been removed to various cellars in Cambridge for safe keeping. Despite most of the windows of the chapel being covered over by sheets of tar-paper which rattled loudly in the wind, the Festival of Nine Lessons and Carols continued to be broadcast from the chapel every Christmas Eve throughout the war – even though the name of the college could not be broadcast for security reasons. King's took the opportunity of these years to clean, repair and photograph the glass. By 1949, all the windows had been restored. In 1961 property millionaire Alfred E. Allnatt offered King's the Adoration of the Magi by Peter Paul Rubens, which he had purchased in 1959 for a world-record price. The college accepted "this munificent gift" with the intention of displaying the painting in the chapel, possibly as an altarpiece. The painting was initially displayed in the antechapel but a significant faction of the fellowship – including Michael Jaffé and Provost Noel Annan – were determined for the painting to become the focal point of an entirely redesigned east end. As the first stage of this project, the Edwardian reredos and 17th-century wood panelling were removed and the Rubens installed in their stead behind the altar in April 1964. The painting was so big that the raised floor of the chapel's east end, required by the 1448 Founder's Will, would have to be levelled so as to prevent the baroque artwork obscuring the bottom of the Tudor east window. However, twenty fellows and honorary fellow E. M. Forster signed a letter urging the college to reverse its plan and "admit that it has made a mistake"; the levelling of the floor nevertheless went ahead. The newly refitted east end opened in 1968 and proved highly controversial, with the Architects' Journal criticising it as "motivated not by the demands of liturgical worship but by those of museum display." The last main-site building to be erected by the college was the Keynes Building, finished in 1967 and named after former college bursar John Maynard Keynes. This building enclosed Chetwynd Court along with the Wilkins' and Scott's buildings, and provided over seventy en-suite accommodation rooms along with other facilities. The first women students arrived at King's in 1972. The college, along with most others at the university, had been all-male since its foundation. However, under provost Edmund Leach, King's together with Churchill and Clare became the first three previously all-male colleges to admit women. Henry VI is not completely forgotten at the College. The Saturday after the end of Michaelmas term each year is Founder's Day which begins with a Founder's Eucharist in the chapel, followed by a Founder's Breakfast with ale and culminating in a sumptuous dinner in his memory called "Founder's Feast" to which all members of College in their third year of studies are invited. The College Chapel, an example of late Gothic architecture, was built over a period of a hundred years (1446–1531) in three stages. The Chapel features the world's largest fan vault ceiling; twenty-six large stained glass windows, twenty-four of which date from the sixteenth century; and Peter Paul Rubens' painting the Adoration of the Magi as an altarpiece. The Chapel is actively used as a place of worship and also for some concerts and college events. The world-famous Chapel choir consists of organ scholars, choral scholars (male students from the college and other colleges) and choristers (boys educated at the nearby King's College School). The choir sings services on most days in term-time, and also performs concerts and makes recordings and broadcasts. In particular, it has broadcast its Nine Lessons and Carols on the BBC from the Chapel on Christmas Eve for many decades. Additionally, there is a mixed-voice Chapel choir of male and female students, King's Voices, which sings evensong on Mondays during term-time. The unofficial Tompkins Table comparing academic performance ranked King's thirteenth out of a total of twenty-nine rated colleges at the University of Cambridge in 2012. In terms of first-class degrees, King's ranked 7th in the university with 27.5% of final year students achieving a first. King's offers all undergraduate courses available at the University, except for education, Land Economy and veterinary medicine, although Directors of Studies for Anglo-Saxon Norse & Celtic and Management Studies visit from other colleges. With more than 100 fellows and some 420 undergraduate students, King's has one of the highest ratios of fellows to students of all the Cambridge Colleges. Since its foundation, the college has housed a library, providing books for all students, covering all the subjects offered by King's. Around 130,000 books are held: some available for teaching and for reference, others being rare books and manuscripts. The library operates a user-oriented purchasing policy: students and Directors of Studies recommend new purchases in their subject. There is both Wi-Fi and Ethernet internet access throughout the library as well as a library computer room. Special collections include a separate Music Library, the Keynes Library, a Global Warming collection, and an Audio Visual Library. The college has gradually broadened its intake to include many students from state schools, often having the highest proportion of maintained school acceptances of the undergraduate colleges. Inevitably this has led to accusations of reactionary bias against public school pupils and of affirmative action (positive discrimination), although the relatively high proportion of state-school students reflects the far greater number of applications from pupils at maintained schools in comparison to other Cambridge colleges. King's has established a Schools Liaison Officer post in order to provide support to students, whatever their background, and schools and colleges of any type to find out more about the University of Cambridge and the college. King's is the link Cambridge College for schools in North East England through Cambridge University Area Links Scheme. Generally, the atmosphere at King's is considered to be easier than that of other colleges to integrate into for students from a working-class or minority background. However, a survey conducted by Varsity Newspaper in January 2009 revealed that the average parental income of students who participated in the survey at King's was higher than the university average. Academic Priyamvada Gopal has refused to supervise students because she maintains porters at King's College often "hassled" non-white staff and students at the gates, which she claims amounts to, "racial profiling". Several students and former students have agreed that this happens. A university spokeswoman has denied wrongdoing by staff. King's has its own student unions, both for undergraduates (King's College Student Union or KCSU) and for graduates (King's College Graduate Society or KCGS). Students at King's have used both organisations to assist in the decision-making processes in the College itself and the University. The college students have a reputation for radical political activity going back to the late 1960s, and the College has not infrequently been the centre of demonstrations, rent strikes and so forth, sparked by political events. There are a number of rooms around college which students can book out to hold society events. Societies who commonly do this include King's Politics, The Turing Maths Society, The History Society, The Marxist Society, Keynes Economics Society and King's Feminist Society. The main bar at King's is the site of many social events, open mic nights, and informal meetings and debates between students, whilst a venue known as the Bunker (formerly the Cellar), a second bar in a basement of the college, acts occasionally as a music or dance-night venue and most recently the set for a King's Drama productions including Sartre's No Exit and a series of monologue showcase events. Even more recently, the Bunker has been used by the King's Electronic Music Society, allowing students to learn how to DJ. Whereas many Cambridge colleges celebrate May Week with a May Ball (which actually falls in June), since the early 1980s King's has instead held a June Event (an informal version of a May Ball with fancy dress) known as The King's Affair. This takes place annually on the Wednesday night of May Week (usually c. 20 June), and is attended by around 1,500 students, occupying the Front Court, bar, Hall and Chapel. Past performers have included The Stranglers, Fatboy Slim, Noah and the Whale and, in 2009, Clean Bandit. There are also large student-run College parties at the end of each term known as Mingles. King's has a number of competitive and casual sports clubs. King's College Boat Club has the largest active membership of any club in King's. In 2013 the first men's boat qualified to race in the Temple Challenge Cup at the Henley Royal Regatta. After several years of poor performances, the boat has returned to a definitive mid-table position in the first division of the Lent and May Bumps, with blades being awarded in Lent 2019. Another major club is the King's Mountaineering and Kayaking Association, which has a fleet of kayaks for use on the River Cam (which runs through the College) and regularly runs climbing, walking and kayaking trips for students of the college during university vacations. Once someone has been admitted to the college, he or she becomes a member for life. Alumni of the college includes prime ministers, archbishops, presidents and academics. Time published in 1999 a list of what it considered the most "influential and important" people of the twentieth century. In a list of one hundred names, King's claimed two: Alan Turing and John Maynard Keynes who had been both students and fellows at the college. Politicians educated at King's include former British Home Secretary Charles Clarke, peer and Chancellor of the University of Cambridge David Sainsbury, Baron Sainsbury of Turville, and Martin Bell. Also in the 18th century alumni include Secretary of State Charles Townshend, 2nd Viscount Townshend (Turnip Townshend), who was also known for his interest in agriculture and role in the British agricultural revolution, judge and Lord Chancellor Charles Pratt, 1st Earl Camden. Historical figures include Francis Walsingham, spymaster to Queen Elizabeth. Alumni in religion include William Thomas, 16th-century Protestant martyr John Frith, Archbishop of Canterbury John Sumner, and Richard Cox who served as Chancellor of Oxford before appointment as Dean of Westminster and eventually Bishop of Ely. Notable alumni in literature and poetry include the authors Zadie Smith, Salman Rushdie, Martin Jacques, J. G. Ballard and E.M. Forster, Nobel Prize winner Patrick White, poets Rupert Brooke, Walter Raleigh and Xu Zhimo, and playwright Stephen Poliakoff. Montague Rhodes James, ghost story writer and mediaevalist spent much of his life at King's as student, fellow and Provost. Author and translator of Aristotle Sir John Harington is also an alumnus, a benefactor of mankind for having invented the flush toilet. In the arts, alumni include philosopher George Santayana; historians Benedict Anderson, Eric Hobsbawm and Tony Judt; composers George Benjamin, Judith Weir (current Master of the Queen's Music), Thomas Ades, and Julian Anderson; the original members of the Grammy Award-winning a cappella group King's Singers; folk musician John Spiers; comedian David Baddiel; and model Lily Cole. In the sciences and social sciences, King's alumni include British sociologist Anthony Giddens, physicist Patrick Blackett, chemist Frederick Sanger, palaeontologist Richard Fortey, economist John Craven, political theorist John Dunn, engineer Charles Inglis, mathematician and eugenicist Karl Pearson. Former Governor of the Bank of England Mervyn King was also educated at King's. Technology entrepreneur Hermann Hauser of Acorn and ARM, studied postgraduate physics there. Of the current fellows of King's prominent fellows include Whitehead and Adams' Prize Winner Clément Mouhot and Fellow of the Royal Society and Clay Research award winner Mark Gross (mathematician). There are eight Nobel laureates who were either students or fellows of King's. Charles Glover Barkla was awarded the Nobel Prize in Physics 1917 "for his discovery of the characteristic Röntgen radiation of the elements". Patrick Blackett, fellow of King's, was awarded the Nobel Prize in Physics 1948 "for his development of the Wilson cloud chamber method, and his discoveries therewith in the fields of nuclear physics and cosmic radiation". Frederick Sanger, fellow of King's, was awarded the Nobel Prize in Chemistry 1958 "for his work on the structure of proteins, especially that of insulin". Sanger was awarded his second Nobel Prize in Chemistry in 1980 jointly with Walter Gilbert for "their contributions concerning the determination of base sequences in nucleic acids". Sanger is one of only four people to have won a Nobel Prize twice, and the only affiliate of the University of Cambridge to have done so. Philip Noel-Baker was awarded the Nobel Peace Prize 1959 for work towards global disarmament. Patrick White was awarded the Nobel Prize in Literature 1973 "for an epic and psychological narrative art which has introduced a new continent into literature". Richard Stone, fellow of King's, was awarded the Nobel Memorial Prize in Economic Sciences 1984 "for having made fundamental contributions to the development of systems of national accounts and hence greatly improved the basis for empirical economic analysis". Sydney Brenner was awarded the Nobel Prize in Physiology or Medicine 2002 jointly with H. Robert Horvitz and John E. Sulston "for their discoveries concerning genetic regulation of organ development and programmed cell death". Oliver Hart was awarded the Nobel Memorial Prize in Economic Sciences 2016 jointly with Bengt Holmstrom "for their contributions to contract theory". The head of King's College is called the Provost. The current Provost, as of 2013[update], is Michael Proctor, physicist and Professor of Astrophysical Fluid Dynamics at Cambridge. The visitor of the College is the Bishop of Lincoln, since 2011 Christopher Lowson. King's was granted its arms on the same day as its sister foundation Eton College. The two shields are identical, save that King's has three white roses, and Eton three white lilies. A version of the arms with the roses argent, barbed and seeded proper (i.e. white or silver, with green barbs and yellow seeds) is often used, though the blazon simply describes the roses as argent. The embellished shield can be seen in the box at the top-right of this page. Sable, three roses argent, a chief per pale azure and gules charged on the dexter side with a fleur-de-lis and on the sinister with a lion passant gardant Or. 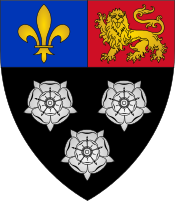 In the grant of arms, the black field is described as symbolising the stability of the college; the roses are described as symbolising the bringing forth of the flowers of knowledge; and the fleur-de-lis and lion represent the royalty of King's foundation by Henry VI, referring to the Kingdoms of France and England respectively. Furthermore, white roses are traditionally a symbol of the Virgin Mary, one of the patron saints of King's. Before the granting of the current arms, King's used a very similar design. The previous shield had two white lilies instead of the outer roses, and a pastoral staff encircled by a mitre instead of the bottom rose. The two lilies represented St Mary, and the bishop's regalia represented St Nicholas. ^ The roses are frequently represented as barbed and seeded proper as above. See pp.54-57, The Cambridge Armorial (1985), London: Orbis. ^ a b "King's College". Undergraduate Study. University of Cambridge. Retrieved 19 July 2012. ^ "King's College Accounts" (PDF). King's College, Cambridge. Retrieved 3 August 2018. ^ see e.g. the logo of the city council, "Cambridge City Council". Retrieved 19 July 2012. ^ a b "History of A Festival of Nine Lessons and Carols". King's College, Cambridge. Retrieved 19 July 2012. ^ Blake, Heidi (24 December 2012). "Hundreds queue overnight to watch Kings College Choir in Christmas concert". The Daily Telegraph. London. Retrieved 19 July 2012. ^ a b c Saltmarsh 1959. ^ "Henry VI". Monarchs and Royals. InfoBritain. Archived from the original on 26 October 2007. Retrieved 19 July 2012. ^ "Eton College History" (PDF). Eton College. Retrieved 17 July 2012. ^ Fay 1907, p. 52. ^ Austen-Leigh 1899, p. 11. ^ Fay 1907, p. 54. ^ Fay 1907, pp. 8–9. ^ a b c d e "College history". King's College, Cambridge. Retrieved 17 July 2012. ^ Fay 1907, p. 10. ^ Austen-Leigh 1899, pp. 150, 221, 279. ^ Benson, Edward Frederic (1930). As We Were, A Victorian Peep-Show. London, New York, Toronto: Longmans, Green And CO. p. 124. ISBN 0701205881. ^ Benson, Edward Frederic. "A Cambridge Alumni Database. University of Cambridge". A Cambridge Alumni Database. University of Cambridge. Archived from the original on 13 March 2018. Retrieved 13 March 2018. ^ Fay 1907, pp. 40–41. ^ Fay 1907, p. 42. ^ Fay 1907, pp. 42–43. ^ "Cambridgeshire Constabulary". National Police Officers Roll of Honour and Remembrance In Memory of British Police Officers who Lost their Lives in the Line of Duty. Police Roll of Honour Trust. Retrieved 19 July 2012. ^ "Saving the Chapel windows". Archive Centre. King's College, Cambridge. Retrieved 19 July 2012. ^ "A season for crying in the chapel: Millions will enjoy today's festival of carols from King's College, Cambridge. But Graham Chainey mourns a botched 'restoration'". The Independent. London. 24 December 1992. Retrieved 19 July 2012. ^ "Carols from Kings". BBC.co.uk. Retrieved 23 November 2015. ^ a b Garner, Richard (11 July 2012). "Trinity College tops Cambridge league table". The Independent. London. ^ "Library recommendations". King's College, Cambridge. Retrieved 14 September 2014. ^ "Internet Access". King's College, Cambridge. Retrieved 14 September 2014. ^ "Special Collections". King's College, Cambridge. Retrieved 14 September 2014. ^ "Table 5.1 Proportion of Home applications and acceptances to Cambridge from the maintained sector by College 2008 and 2007" (PDF). Cambridge University Reporter. CXXXIX (Special No 17): 15–16. 20 April 2009. Retrieved 19 July 2012. ^ "Schools Liaison Initiative". King's College, Cambridge. Archived from the original on 31 August 2009. Retrieved 19 July 2012. 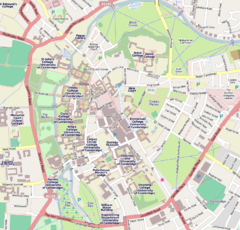 ^ "Cambridge University Area Links Scheme". Cambridge University. Retrieved 21 February 2013. ^ Tunstall-Behrens, Caedmon (23 January 2009). "From dumpster-diving to raucous revels" (PDF). Varsity. Cambridge. pp. 1, 4–5. Retrieved 18 July 2012. ^ "No Exit news item". King's College, Cambridge. Retrieved 21 February 2013. ^ "KCBC". KCBC. Retrieved 14 September 2014. ^ "King's Mountaineering and Kayaking Association". Archived from the original on 17 October 2013. Retrieved 14 September 2014. ^ Isaacson, Walter (31 December 1999). "Who Mattered And Why". Time Magazine. Retrieved 29 May 2011. ^ "Nobel Prize 1917: Charles Glover Barkla Biography". Nobel Prize Website. Retrieved 23 April 2017. ^ ""Charles Glover Barkla"". Encyclopedia Britannica. 26 October 2016. Retrieved 23 April 2017. ^ O'Connor, J.J.; Robertson, E.F. (November 2007). "Biography: Charles Glover Barkla". School of Mathematical and Computational Sciences, University of St. Andrews. Retrieved 23 April 2017. ^ "The Nobel Prize in Physics 1948". Nobelprize.org. Retrieved 20 July 2012. ^ a b c d e f g "Nobel Prize Winners". Research at Cambridge. University of Cambridge. Retrieved 4 April 2017. ^ "The Nobel Prize in Chemistry 1958". Nobelprize.org. Retrieved 20 July 2012. ^ "The Nobel Prize in Chemistry 1980". Nobelprize.org. Retrieved 20 July 2012. ^ "The Nobel Peace Prize 1959". Nobelprize.org. Retrieved 20 July 2012. ^ "The Nobel Prize in Literature 1973". Nobelprize.org. Retrieved 20 July 2012. ^ "The Sveriges Riksbank Prize in Economic Sciences in Memory of Alfred Nobel 1984". Nobelprize.org. Retrieved 20 July 2012. ^ "The Nobel Prize in Physiology or Medicine 2002". Nobelprize.org. Retrieved 20 July 2012. ^ "The Sveriges Riksbank Prize in Economic Sciences in Memory of Alfred Nobel 2016". Nobelprize.org. Retrieved 4 April 2017. ^ King's College Statutes 2007, s. P(1). Austen-Leigh, Augustus (1899). King's College. University of Cambridge: College Histories. London: F.E. Robinson & Co. OL 7238809M. Retrieved 19 July 2012. Fay, C. R. (1907). King's College, Cambridge. The College Monographs. London: J.M. Dent & Co. OL 7080428M. Retrieved 18 July 2012. Saltmarsh, John (1959). "The colleges and halls: King's". In Roach, J.P.C. 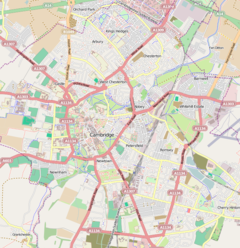 A History of the County of Cambridge and the Isle of Ely. Volume III: The City and University of Cambridge. Victoria County History (via the Institute of Historical Research). OL 11245527M. Retrieved 19 July 2012. Wikimedia Commons has media related to King's College, Cambridge.